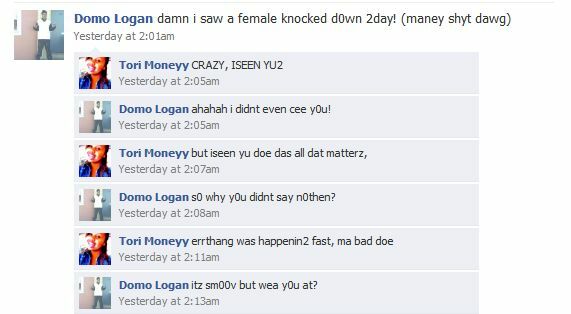 While we can't make out exactly what these young adults are saying, Domo Logan, friend of former murder suspect Phil Stewart and self-described eyewitness, had a public conversation on his Facebook page about the shooting that took the life of Mechthild Schroer, a German tourist in town celebrating her birthday and wedding anniversary. Logan, it seems, was part of the private party that eventually erupted into gunfire in the city's theater district. Logan's most recent post proclaims, "FREE MA BRUTHA PHIL.....CANT SAY 2 MUCH RITE N0W TE0 NIGGAZ G0 2 THAT 1ST C0URT DATE...KEEP YA HEAD UP S0UJA!!!! 4Z UP 2 THA DEATH 0F ME BURRRRRR." Muni Diaries brings out attention to this nifty bit embroidery. As you can tell, it's a Muni transfer as conceived by Flickr user tweetsweet.